Investment Analysis stores portfolios as catalog entries. Portfolios contain a collection of investments, providing a structure to collect investments with a common purpose or goal (like a retirement or building fund portfolio). It may be advantageous also to collect investments into a common portfolio if they are competing investments you want to perform a comparative analysis upon. Within this structure you can perform computations and analyses on a collection of investments in a portfolio, just as you would perform them on a single investment. Investment Analysis provides many tools to aid in your manipulation of portfolios through the File menu, shown in Figure 55.1. New Portfolio creates an empty portfolio with a new name. Open Portfolio opens the standard SAS Open dialog box where you select a portfolio to open. Save Portfolio saves the current portfolio to its current name. 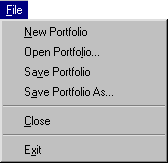 Save Portfolio As opens the standard SAS Save As dialog box where you supply a new portfolio name for the current portfolio. Exit closes SAS (Windows only).